Volume I of A Fitzwilliam Legacy: Seasonal Disorder by Tess Quinn, is a beautifully written and entertaining sequel to Pride & Prejudice. 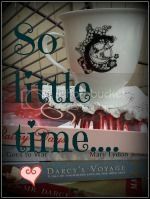 The author has just the right mix of ‘Darcy and Lizzy’ time, scheming and interfering relatives, romance and angst, all the while keeping the characters true to canon. Ms. Quinn introduces several new characters that are well developed and likable, especially Sir James Thornton and Amelia Chaney. This volume begins on December 24, 1798, (the delightful prologue in November of that year) with Darcy and Lizzy happily married and hosting their first Christmas party at Pemberley. With their guests, family and friends, invited to share this special time, all are looking forward to the festivities that the season has to offer and even a few secrets to be divulged. What would any party be without a party crasher or two? When one of those is Lady Catherine deBourgh, it only stands to reason that some sort of discord will follow. Indeed it does and with her machinations she upsets the lives and peace of everyone in residence at Pemberley. Much to her shock and surprise, an important person from her distant past is one of the ‘invited’ guests. Although everyone else is unaware of the connection between Cat and this guest, their reunion causes a strong impact that sets up a very interesting chain of events. This same guest also plays an important role in the lives of Charles and Jane Bingley. An additional part of the narrative that I relished was the growing friendship between Georgiana and Kitty. Their girl talks and times together read like one would expect of two teenagers. There is love in the air for both of them and the author develops the men in their lives and the budding romances with tenderness and much insight. I am eager to read New Year Resolutions (Volume II) to see how their stories culminate. Dear Colonel Fitzwilliam plays a very important role in the novel as it centers on him and a widow he is helping. As his feelings grow in intensity, there are obstacles that present themselves – and get presented – that make his desired outcome seem hopeless. I hope that Volume II will bring the resolutions to his dilemma that give him the life he deserves. Throughout the book we see a very devoted and happy Mr. and Mrs. Darcy, who have a few surprises of their own. We get to see that life after marriage is good but not problem free. 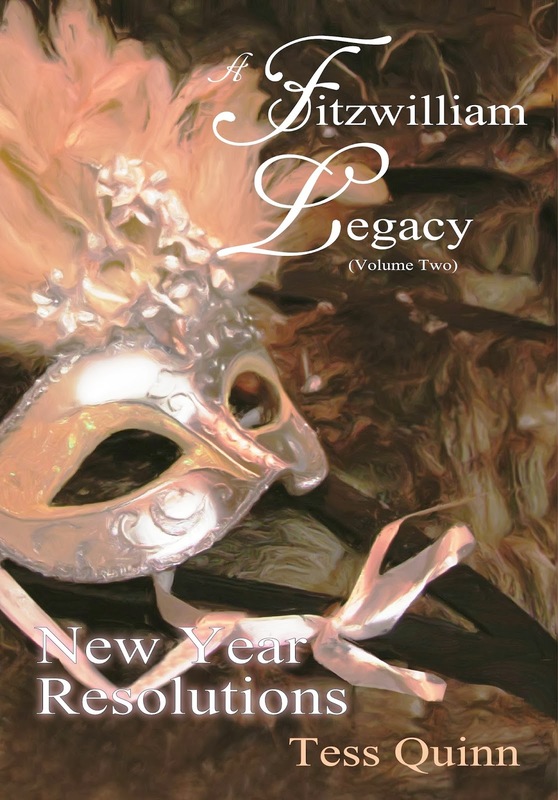 Volume I ended with Darcy and Lizzy just after midnight, New Year’s Eve with a very loving and chaste scene. Perfect! 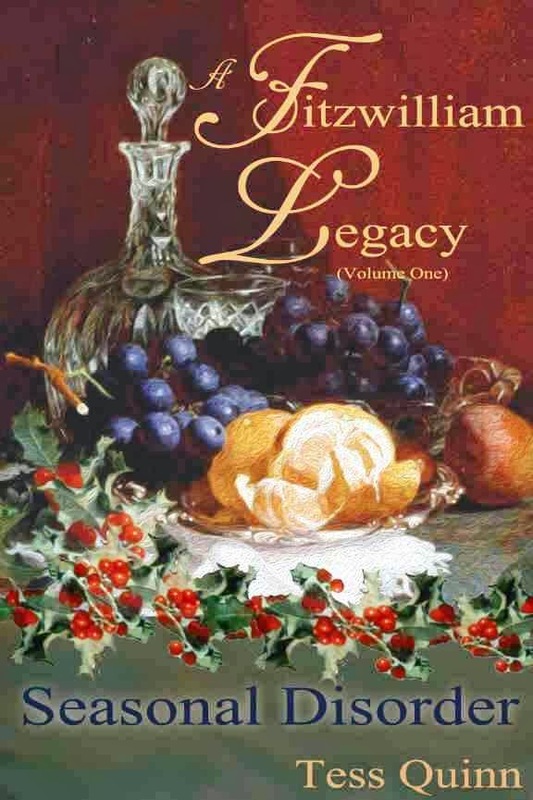 A Fitzwilliam Legacy: Seasonal Disorder is an excellent book and one I found difficult to put down. The main plot and subplots flow into one seamless tale. Tess Quinn has a style of writing and story-telling that is superb. It is obvious she knows about the time period, the language spoken and the word spellings, as well as the customs and traditions of the Christmastide season. She uses her talent and skill to write a lovely and believable story, one that honors Jane Austen and her characters. Volume I would be an excellent read at Christmas or any time of year. I highly recommend it. Who is Sir James Thornton and what is he concealing? Will it be ‘happily ever after’ for Colonel Fitzwilliam? What will happen to Anne deBourgh? Will Georgiana and Kitty find true love? Stay tuned my friends. For the answers to these and other questions, I will be reviewing Volume II, New Year Resolutions in the coming weeks. In conjunction with this review author Tess Quinn is giving away one paperback to a lucky winner, US address only. She is also giving away one digital copy for an eReader to another lucky winner, and this one is international. The winners may choose either Volume I or Volume II. We want to hear your share in the conversation so please leave a comment to be entered in the giveaway. Good luck to all. Giveaway will end at midnight, January 29, 2014. Your lovely review makes me want to read Tess Quinn's book. I'm impressed by authors who get Regency language right because it's not easy and something I struggle with every time I start to write. The covers to these books are striking! Thank you, Jan! If you knew the story (and trauma) behind the making of those covers you'd know how much I appreciate that remark! I work at the language, too... spend a lot of time with etymology sources... but I love it. Thank you, Jan. I hope you get a chance to read it. Good luck in the giveaway. I love to have lots of Colonel Fitzwilliam in a story too, especially when he is true to character. He is great in these two books. I hope you get the chance to read them. Why is it, do you think, that Colonel Fitzwilliam appeals to so many of us (for of course I am included in this group) -- hmmm, that could make an interesting 'study'! LOL Thanks for your interest and comment, Vesper, and good luck in the drawing! Thanks for stopping by, Marti! Lady Cat is really trying herself this time but she has some surprises heading her way too. Good luck. Great review! I'm looking forward to this one. I love it when Col. Fitz gets stronger roles and stories explore what comes after the HEA. Thanks! Hi Sophia. So glad you stopped by. Colonel Fitzwilliam has a very strong and good role in this one. I think you will love him and the books! Good luck. Thanks, Sophia Rose -- I hope you'll enjoy the HEA, though it's more a HE-in-the-making here! I'll leave it to you to decide how strong and good my friend the Colonel is -- Good luck! Janet, thank you so very much for this lovely review! I am, as you might suspect, delighted at it and grateful that you took the time to write such a comprehensive one. Impressed, too!--that you managed to include so much detail without giving anything away, kudos for that! More to the point, I am delighted that you enjoyed my story - for that, in the end, is why I write them!!! Thanks again -- I can't wait to hear what you'll think of the second volume, whether I concluded everything in a satisfactory manner! You are welcome, Tess. I loved the book as you can see and I appreciate your comments about the review. I will be posting one for Volume II in the next few weeks. I hope you write many more stories. This book sounds great and I, too, am impressed that Janet's review is so detailed yet has no real spoilers :) So hard to do, at least for me! Thanks so much for the chance to win a copy. Glad you stopped by and commented, Monica. Thanks for your comments about the review. Reviews do not come easy for me. I have to work at doing justice to the book without ruining it for readers. It is hard for me too! Your words encourage me! Thanks, Monica, for your interest -- and good luck with the drawing! Wow, Tess, great review. I know I don't qualify for the contest, but I thought I'd pop in and congratulate you. I'm glad you came by, Suzan. Hope you will visit often. Thank you, Suzan - I'm so glad you did 'pop in'!